Leonardo DiCaprio has presented passionate videos that Climate Change is a fact. He draws on the unanimous scientific consensus. Not so the Trump presidency, where Climate Change in America is swiftly being placed on the back burner and will soon be out of the door. Trump has dubbed climate change as a hoax created by the Chinese government to make US manufacturing non-competitive. He tapped Myron Ebell, America’s most prominent climate change skeptic, to oversee the transition of the Environment Protection Agency (EPA) with a view to roll back the extensive environmental platform created by the Obama administration. Myron Ebell is not a scientist and does not believe in scientific facts endorsed by climate scientists. He talks glibly about the actual benefits of climate change and rightly earned the “climate criminal” tag from Greenpeace. Trump then selected Scott Pruit to run the EPA. Pruit is an ally of the fossil fuel industry and his selection will destroy the US Clean Power Plan and all the other environmental measures put in place over the past eight years. He proposes to open up federal lands for logging and carbon extraction – oil, gas, coal – and rejects the Paris climate change accord. Conservation is not part of his vocabulary, so it is in the cards that the XL pipeline will be built, federal parks will end up drastically diminished, off-shore drilling permits will be abundant while conservation measures are dumped world-wide. The strategic momentum engineered by these two climate change deniers makes America a rogue state. Its impact will destabilize global efforts to reign in climate change. Myron Ebell’s organization – Competitive Enterprise Institute (CEI) – is financed by Exxon and the coal industry. It is part of the powerful international misinformation machine that pours millions of dollars into the campaign that discredits climate scientists. CEI masquerades as a think tank but is in fact a corporate lobbying group that buys the politics that protect the interests of billionaires, who, by the way, have no concern for a sustainable environment. Fossil fuel interests greeted Trump’s strategy with elation in anticipation of a new bottom line – protection of carbon profits for Trump’s corporate cronies. The existence of the EPA is endangered and will likely be cast aside. Trump and his acolytes give no hope for our deteriorating planet. The recipe is in place to create disastrous global consequences. My latest book New Planet, New World is set in 2080. It charts the inevitable space mission to inhabit a new planet made necessary by willful ignorance about Climate Change on Planet Earth. Culture crash late in the twenty first century opens this epic novel. Children travel via spacecraft to a distant planet to escape Earth. A sharing of cultures-technologies ensues as they join other Earth refugees to form a new, sustainable, caring community with ethics and a moral compass. Intertwining plotlines arc into the epiphany of the final chapter, the end game of a philosophy for the future. The inclusiveness of science combines with Tolstoy’s vision, Pope Francis’ Climate Change Encyclical and not repeating the mistakes of the carbon cabal. The underlying message is from Tolstoy, the ‘Conscience of Humanity.’ He described humanity’s bottom line as the cultivation of love, the mainspring for authentic and responsible living. This final chapter – Musings on the Future of Humanity – was written long before Trump ascended to the presidency in America. However, readers pointed out that I had provided an antidote for all that Trump intends to implement. I bring a more sensitive and poignant stance to your attention, by seeing climate change through the eyes of a terrified nine year old boy. My grand-nephew James was recently celebrating his birthday, yet he felt awful and very sad about being nine. He wished he could stay five years old forever. When asked why, he replied that if he could stay five then the Earth would not explode. His lips quivered and the tears welled up in his large brown eyes. He said, “I don’t want to grow up and live in a world that is burning.” In the silence that stretched between us I wondered what to say. I could not say that everything will be OK, that my generation will fix things. He was much too intelligent for such placebos. So I spoke to him about the mindfulness community I created in 1997 – Pine Gate – and the deliberate steps taken for planetary care. We simplify, make do with less, share and adapt. Our intent is to create environmental leaders and that includes him. “Why not become a leader for your generation?” I asked him. He thought about that intensely and asked what else did Pine Gate do? I pointed out that Pine Gate encourages Voluntary Simplicity and Community Ethics as a way of life. We start with the Earth. Our organic garden produces an abundance of vegetables, apples and flowers that are shared with neighbors and community members. It is a solace for me to spend time with the Earth, observing bumblebees and butterflies while gardening with assistance from neighborhood children. I told James that the kids once went into hilarious laughter when they saw that the plant I had carefully nurtured turned out to be a giant weed and not a tomato plant! We had great fun returning it to the compost bin. At the back of the garden is a beautiful fountain that murmurs ‘midst the flowers, which are picked and sent to the elderly folk living on our crescent. A simple underground economy arises from the sharing. A solar panel on the roof fuels the hot water system. Everything else is as eco-friendly as we can make it for our fifty year old bungalow with a meditation hall in the basement. This eco-effort has become an example for other friends as they do the math on how much cash we are saving and implement something similar. Our focus is on mindfulness in schools, city environment, teens at risk and on the empowerment of women. I admitted to James that I am blown away by the results, for at the local level there were great women who helped make things happen. The idea behind Pine Gate is to foster a strong cadre of people in Ottawa to make a difference for the betterment of society and the Earth Mother. Women are in the forefront of this endeavor. They are the heart that holds the living waters and that heart is the dynamic epicentre that leads to effective action. That is how we get things done to create a different course of action and living. James was taking it all in. He knew instinctively that major changes were needed. I intimated that when enough of us change, then we will be in charge. I told him about a speech I gave about violent consumption. His sharp mind held on to every word as I pointed out that festive occasions like Christmas provide opportunities for the best and the worst within us to come out and play. Yet compassion and kindness are quickly overshadowed by greed, selfishness and consumer madness. We need to re-assess, as it is time to move on from being self-absorbed and distracted. “How?” he asked again, as he really wanted to know. So I gave him this list. I related to James that my grandchildren proudly take their Christmas certificates to school for Show-and-Tell periods. They play it forward with their class mates and teachers. One boy on the crescent where I live has received such gifts from me for several years. For his most recent birthday he asked all his friends not to give presents, but to bring a donation for the Ottawa Humane Society that looks after hurt animals. All of his friends brought donations, a splendid sum of one hundred and eighty dollars. They all went together to the Humane Society and happily handed their bag of cash to the surprised staff. Other children in the neighborhood have followed suit. This resonated with James and he said, “I could do that with my ice hockey team. My dad is the coach and he would help.” He waited for me to continue. “James, the greatest gift we can give to ourselves and others at this time of global crises is Sharing and Caring. It involves stepping onto what the Buddhists call the Bodhisattva Path.” (James knows that I am a Zen teacher.) I explained that a Bodhisattva was a person who stayed in the global mess and did their best to awaken the minds and hearts of people. I firmly stated that it is time for the Bodhisattva-within-us to enter the 21st century as the example for action. It takes training, practice, smartness and creative vision. “You mean like Jedi training?” he enquired. I nodded with a smile. I referred briefly to my years of training in ashrams and monasteries in India and France and with Native American medicine people. I confided that the real kicker for me was the time spent alone in the Canadian wilderness. I promised to talk to him about this at some future time. Then he asked, “So what is the big deal about violent consumption?” I replied that it totally dominates our planet, mind and body. I knew that James’ greatest fear was about the planet’s ecological crises, from mining disasters in Brazil and China, wildfires in Canada’s Boreal forests, Amazon deforestation – all the way to the Gulf Oil Spill where tons of toxic oil dispersants contaminate the oceanic ecosystem. “How do we change this mad destruction of the planet?” James exclaimed. I wondered how best to explain matters to him, yet trusted his intelligence. I said, “We must come to a stop, locate ourselves in stillness and make different choices by examining our minds, consumption patterns and then see how we actually participate in creating these terrible disasters.” I noted that this kind of awareness takes us back to what we do with our minds. I could not turn away from his eagerness. I mentioned that if rampant consumption remains our deepest desire we will have a degraded planet that will certainly blow up. His fears were correct. Valentine’s Day, Easter, Christmas, Mother’s Day and so on are targeted by the captains of industry for optimal retail returns, and mindless consumerism is fuelled to the max. At Christmas we are far removed from remembering the significance of this spiritual celebration. Endless economic growth, the mantra of modern civilization, provides a promise of expectations being met without any awareness of consequences for our own health or the health of the planet. Our current non-sustainable energy and economic systems are subsystems of a global ecology that is disintegrating before our very eyes. If we do not simplify, make do with less and change, then the vicious downward spiral to a burning world would definitely occur. “That is so gross,” remarked James. I told him that we can change our minds and patterns of food consumption. We re-educate and retrain ourselves mentally and choose to support our body and planet by shifting ingrained food habits. It takes training but we begin to step more lightly on the planet. It means reducing as much as possible the violence, destruction and suffering brought to living creatures and to the planet. If we bring violence into our own biological system and consciousness, then we inevitably bring violence to all the other systems that we engage with through our thoughts, speech and actions. I emphasized to James that the disasters all over the world interconnect and reinforce each potency to explode. Whether it is wildfires, floods, landslides, volcanic eruptions, hurricanes, tsunamis, millions of aquatic creatures dead on beaches, it goes on relentlessly. The media and news reporters cast science to the wind when they report the drama and hype of terrible things happening world-wide but rarely tell the truth that, “Here is another manifestation of Climate Change.” News programs are often showbiz and full of fake news. Journalists function as pawns to corporate interests that are culpable in the first place for creating the tipping points that cause these interconnected disasters. So the general public are not educated by the media about the terrible realities happening on our planet. That is a big obstacle. The other obstacles preventing the general public taking wise action are a mixture of fear, despair, sheer laziness, disempowerment and a sense of hopelessness. I told him I had written a futuristic book – New Planet, New World – which provides a counterpoint story to the demise of our modern civilization. In this book I chart a communal Hero’s Journey to reconstruct society based on ecology, caring and sharing. The final chapter muses about human survival anywhere. The drive is to create a tangible spirit of co-operation, the willingness to share and be supportive and intuit how to cross the bridges of misunderstanding. In this novel my intention is to provide a reflection of the disasters of the world today. The rich and uber-wealthy already inhabit armed, gated communities and will be targets for eco-militias and popular uprisings drawn from the impoverished masses – and they are intent on revenge. “Wow,” exclaimed James. “OK, I get it about training but what does it look like?” I was relieved by his intelligence but hesitant to talk to him about what I was thinking. “Why should we do all this stuff James? Here’s why. When you can be open and receptive you become an epi-center of light and energy for others. When you can just sit with pain, come face to face with what hurts, breathing in and breathing out, you feel the sting recede as you calm. If you start to close down ask yourself, “Do I really want to take a pass on happiness?” Always let go once you feel you are closing down or clinging.” Then I said to him, “Do you know that I have a fridge magnet at home with the words – LET GO OR BE DRAGGED? I see it every day and take the message to heart with a quiet smile. It is essential to learn to be silent, to stop clinging and find the way to be present. As the Hopi advise us, never take anything personally and look around to see who is with you. As you do all of this then the world changes as a consequence. Such a destination is well worth your effort don’t you think?” James nodded his agreement. My conversation with young James was all about Engaged Buddhism – the essential teachings of the Buddha. 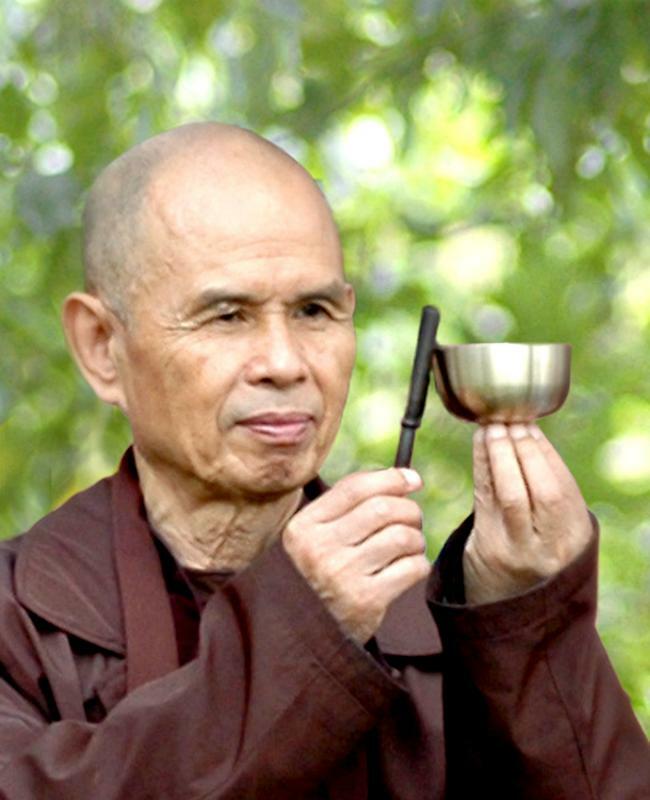 Engaged Buddhism is a modern term coined by Thich Nhat Hanh to remind buddhists that the Buddha’s teachings were always based on Engaged Buddhism. In the past there was too much attention on forging feudal structures to support monasteries in the East and so the foundation of Engaged Buddhism got lost. It is up to us to revive Engaged Buddhism and live it in every moment of our lives. If the reader connects the dots of my conversation with young James, you would see clearly that Engaged Buddhism is the antidote to all that Donald Trump stands for. Essay Eleven: The Buddha at the Gate. Let me tell you a story. There was a young monk who was sent by his Abbot to beg for food in a nearby town. The town had a wall around it, with a main gate placed at each cardinal direction. The young monk was a little nervous during his first alms round but the townspeople were very generous and quickly filled his bowl. Late that morning he decided to leave by the North Gate. Sitting to one side of the gate was a bedraggled, dirty old beggar who stirred himself at the sight of the young monk and started to spit and curse at him. The monk jumped to one side in alarm and quickly passed through the gate as fast as he could. As he walked away he could still hear the beggar’s curses ringing in his ears. On the next day once his bowl was full he decided to leave by the West Gate to avoid the dreadful old beggar. But the beggar was there, spitting and cursing at him once again. The young monk was angry this time and shouted at the old beggar “Don’t you know who I am? I am a student of the Buddha!” At which point the beggar picked up some dirt and threw it into the bowl, spoiling the monk’s collection of food. Angrily the young monk walked back to the monastery, knowing he would have to endure an enforced fast, wondering why he should be treated in this way. So he made up his mind to breathe and calm himself and to totally ignore the beggar if they should meet again. As he left by the South Gate next day he met the old beggar, still cursing and spitting at him. He protected his food with part of his robe and kept his head down as he endured the abuse from the old beggar once more. His heart was in turmoil, his mind in so much distress that he could eat nothing from his bowl once he reached the monastery. Next day he left by the East Gate and to his dismay the same old beggar was waiting for him. As he heard the curses and endured the spitting, the young monk raised his walking staff to strike the old beggar, who just cackled in glee at the young monk’s discomfort. With a moment’s pause the monk stayed his hand and walked quickly through the East Gate. He was deeply ashamed at how close he had come to violence. He felt he was a wretched student of the Buddha and totally confused as to why all this abuse was happening to him. He suffered so much from the anger and violence inside himself that he knew he needed his Master’s guidance. He sought out the Abbot and asked for forgiveness and guidance after he told the story of his past four days. The Abbot listened deeply to the young monk then smiled very gently with understanding. The Abbot instructed him on the Buddha’s Teachings on Love, Compassion, Joy and Equanimity; the Four Immeasurable Minds. Also known as the Four Brahmaviharas, these teachings were first given by the Buddha to a Hindu gentleman who wished to find the way to be with Brahma, the Universal God. The young monk was instructed to deepen his practice, to listen deeply to his heart and always to stop and look deeply into the causes and conditions of his reactions, anger and violence. The young monk bowed in gratitude to his Abbot and diligently practiced meditating on the Buddha’s teachings, immediately putting them into daily practice. This enabled him to pass by the beggar without reaction, until one day no beggar was to be found at any of the four gates. This simple teaching is something we can all put into practice and not activate the demons in our own mind. A better world is the end result. The Noble Eightfold Path is the Buddha’s methodology to lead us out of suffering. I will offer dharma talks on the entire spectrum for the remainder of Pine Gate’s Winter Study Session – beginning with Right View and the 4 Nutriments. This will be a series of foundation teachings, as everything in Buddhism comes around for this visit to the Eight Fold Path. Recommended reading is Thich Nhat Hanh’s “The Heart of the Buddha’s Teaching” Part Two: The Eightfold Path. The dynamic nature of the Eightfold Path will be highlighted by emphasising how Mindfulness and Concentration are crucial to kick start the process by transforming Views into Insight. The views we hold strongly are often attitudes, perceptions and attachments that are capable of cascading through the other components of the Eightfold Path so that Thinking, Speaking and Action are modelled on wrong views. Right View is no view – rather it is insight, which is why Mindfulness and Concentration are required to start the engine of the Noble Eightfold Path.